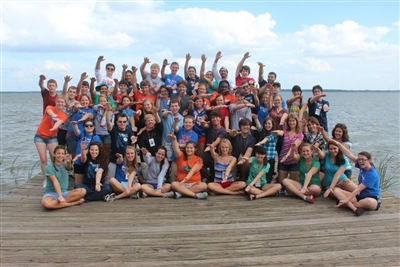 GAINESVILLE -- Gator Wesley Foundation at the University of Florida has been awarded a $100,000 grant from the Lilly Endowment Inc. to fund a Campus Ministry Theological Exploration of Vocation Initiative over the next five years, beginning in January. According to Clay Robbins, president and chief executive officer of Lilly Endowment, Gator Wesley Foundation is one of five campus ministries to be awarded such a grant. The award aims to help selected ministries strengthen their efforts to encourage students to explore potential calls to Christian leadership, Robbins said. 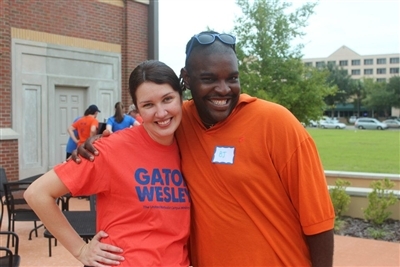 Gator Wesley is widely known for the quality of its ministries and was highly recommended by consultants and other campus ministries. “Our hope is that these grants will help these ministries create or enhance campus models for cultivating leaders for Christian churches and that other campus ministries will learn from their efforts,” Robbins said. Gator Wesley students enjoy fellowship, spiritual growth and leadership development at retreats such as this one at Warren Willis Camp last fall. Photo from Gator Wesley Foundation. Rev. David Fuquay, executive director of Higher Education and Campus Ministry at the Florida Conference and Gator Wesley's campus pastor until last summer, said the funds will be distributed in $20,000 increments for five years. “It is a huge honor that Gator Wesley was asked to apply for the grant, and [getting it] really enables Gator Wesley to do some innovative things,” Fuquay said. Fuquay cited the Upper Room staff at Gator Wesley as one existing facet of the foundation that will be helped by the grant. He praised the excellent, rapid work done by Rev. Narcie Jeter, who left Winthrop University in South Carolina and stepped in as Gator Wesley pastor and executive director July 1, with only two months to meet the Sept. 1 application deadline. “This grant will enable us to help students explore the link between faith and vocation across the campus, not just at Gator Wesley,” Jeter said. Gator Wesley Pastor Narcie Jeter with University of Florida senior Bernard "B.J." Johnson II at a welcome-to-campus cookout. Photo from Gator Wesley Foundation. Fuquay emphasized that the speaker series will highlight the idea of vocation in all different fields. “Meeting a doctor who is living out their faith, or hearing someone speak about their vocation and their faith can help,” he said. Rev. Beth Fogle-Miller, Connectional Ministries director at the conference, said that's what impressed her most about the planned grant program, which she finds to be very Wesleyan in its approach to developing deeply rooted disciples. "It links personal growth with the capacity for leadership because you cannot separate those," she said. "It's developing principled leaders for the church and the world." Jeter said the grant also will provide more vocational discernment opportunities for the ministry's intentional living community known as the Upper Room staff and travel across the U.S. and abroad for encounter experiences, including the United Methodist Seminar Program, Exploration and Imagine What's NEXT. Jeter and Fuquay said the global exploration aspect of the program will be important. “International trips, like one scheduled for Costa Rica, will enable students to discern God’s call in their lives in a more intentional way,” Fuquay said. 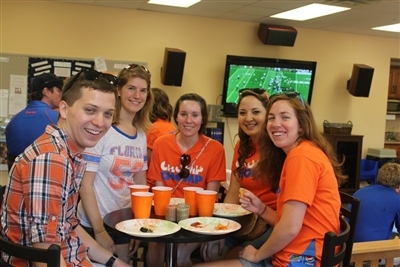 Members of Gator Wesley Foundation get together for a meal before a home football game at the University of Florida. Photo from Gator Wesley Foundation. He said the grant could lead to a model for other higher education ministries. Nikki Ross is a senior on the Upper Room staff at Gator Wesley. She said she didn’t have a lot of information about the grant, but she is excited about the prospect of what it will enable students to do with their ministry on campus. She cited the speaker series in particular. “The speaker series is a good way to reach out to students on campus who aren’t regulars at Gator Wesley," she said. The other four campus ministries awarded grants are Chesterton House at Cornell University, Ithaca, N.Y.; Pres House, a ministry of the Presbyterian Church U.S.A. at the University of Wisconsin in Madison; St. Lawrence Catholic Campus Center at the University of Kansas in Lawrence; and Holy Trinity Lutheran Church at the University of North Carolina at Chapel Hill. *Anne Dukes is a freelance writer based in Atlanta.